This sober bathroom interior is for those spaces where functional elements are essential with the other elements of style and elegance for keeping a good balance. 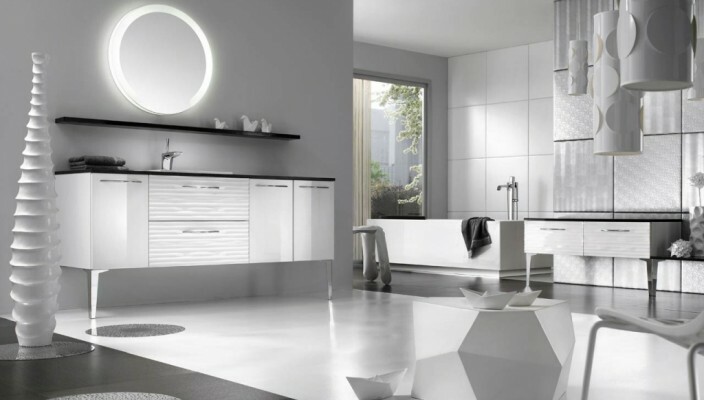 This bathroom concept uses some essential functional units to create a dream like environment. The common things used here is a laundry basket, two sliding units and drawers. With the fronts in a glossy white lacquered finish and shelves in glossy graphite lacquered finish, the design is perfect for large spaces. Other elements used include a mirror and vanity unit, which gives the design the level of functionality required with a sober balance in the interior theme.